As an aging homeowner, a primary goal may be to save money wherever you can. If you are retired, you may also be on a fixed income that requires you to be careful with your spending. One of our most significant pain points in life is how much we spend on utilities so having the ability to monitor how much electricity something is using could add up to a lot of money in your pocket. If you are a caregiver, it will grant you a lot of peace of mind knowing that any appliances that could cause harm are switchedoff in your loved ones home when they are not in use. You may also be concerned that a loved one is having a hard time managing power associated with the electronics in their home. As time goes on our lives are becoming easier through the use of technology and in this article we are looking at the best smart outlets to help save you some money on your next electric bill. This smart outlet is an excellent choice for its smart home compatibility and its ability to be easily controlled from your fingertips. We chose this smart plug set as our best overall smart plug for its versatility and functionality with a wide range of smart home devices. Once you plug these into your outlets, you can control your lights and appliances directly from an app that you download to your phone. The app is easily downloaded using the Google Play Store on Android or the Apple Store if you have an iPhone. Controlling devices from your phone helps to save electricity and lower your energy bills every month. You can also monitor your energy consumption right from the app as well. The app also gives you real-time reports on how much energy you are using. 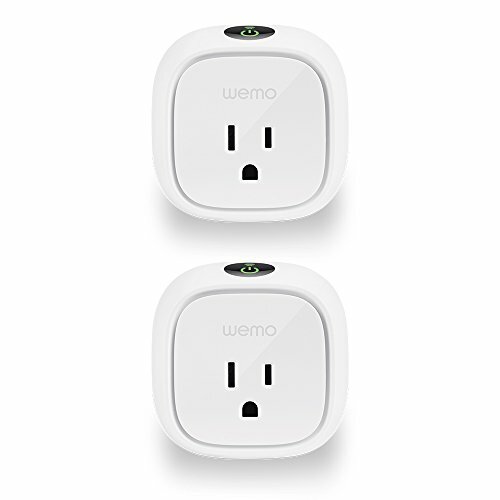 For this to work, you need to plug the item you want to measure into the outlet with the smart plug in it. Another useful feature is the “Away Mode”, where users can set specific times of the day to turn the an item on and off automatically. 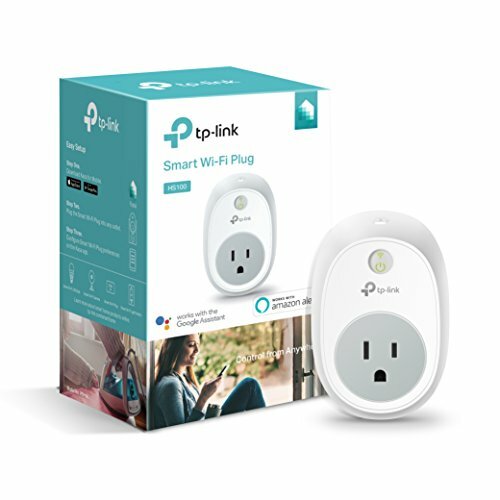 If you are testing out smart home products or looking for something on a budget this smart outlet gives you everything you need to see if you’re ready to become smart home enabled. 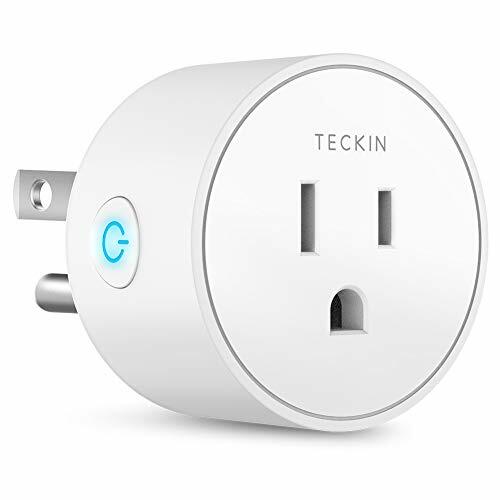 If you are interested in something that is more budget-friendly or you are trying this type of product for the first time, you might want to go for something more like the Teckin Smart Plug. You can control these smart plugs directly from a free app that you download to your phone called Smart Life. Once you download the app, you can also link the outlet to your other smart home devices like Google Home and Alexa. This one also comes with a timer and schedule feature, and we find that it works incredibly well and has little connectivity issues. This outlet connects easily to your existing Wi-Fi and the app. While connectivity is seamless with this unit it is bulky and difficult to install. This smart plug comes in a pack of two and connects seamlessly to your Apple iPhone. The outlet is also compatible with Alexa devices and Google Home. This product allows you to control control up to 50 sockets from your phone. With so many devices to manage at once the interface allows you to control the outlets separately from one another. 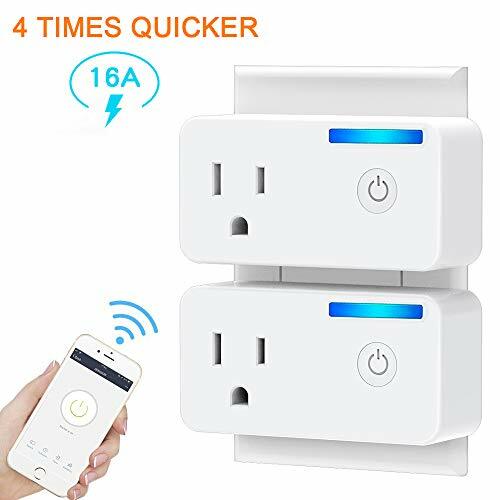 This means if you wanted to you could group the outlets into different rooms so you could turn on or off entire rooms directly from your phone or smart devices. Whether you are a caregiver or homeowner looking to make life easier, this a product has a high amount of utility. The features, the compatibility, and the connectivity make this smart plug one of our favorites. You get a perfect connect with little issue but with that comes a bulky device that takes up your whole outlet. This smart outlet is an excellent choice for its Android compatibility. You can control anything plugged into the outlet directly from the app you download in the Google Play store. You can only manage the items you have directly plugged into the outlet. The smart plug is also compatible with your other smart home devices like Alexa and Google Home which seems to be standard among most of these outlets. Kasa only comes with one outlet but if you have more than one you can control them all simultaneously from your phone. This plug has only a few minor issues that might not even matter to you. The size of the plug is overwhelming, and we wish it was smaller or that the outlet itself was on the side or bottom. Once you plug this in, it takes up a lot of space, and it covers both outlets. There is also quite a bit of heat buildup which is concerning if you are a Caregiver using this product in someone else’s home. We love this product because it offers you the ability to control up to 50 outlets from the app. Plus, you can set up rooms to be controlled separately from others which is a unique but necessary feature. 【No Hub Required】The smart plug works with any WiFi router without the need for a separate hub or paid subscription service. 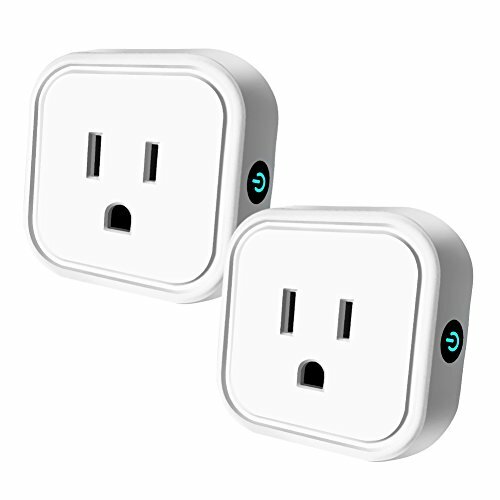 This two pack of smart plugs come with Alexa and Google Home compatibility and also connects to the Smart Life app from the Google Play Store or Apple App Store. The device works with a maximum of 15 amps and fits nicely onto your wall outlets. This unit allows you to put two outlets on one, which can be tough on competing devices of this kind. . The plug has an aesthetically pleasing blue glowing light when plugged in. OMOTON also provides a CE and FCC certification for flame and heat resistance. With that, they offer a one year warranty. This smart wall outlet does everything you would expect and is compatible with all smart home devices. It is easy to install using a do it yourself instruction video. Instructional Video for easy install and connect. No Hub Required. This device comes in packs of one or two and connects with most other smart home devices like Google Home and Alexa. This one also uses the Smart Life app and allows you to control anything plugged into that outlet directly from your phone. With the plug comes an instructional video that we feel does an excellent job of explaining its features and functionality. You can also set timers and different settings to turn certain items on and off at specific times. This unit is an excellent choice because it offers all of the standard features like Smart Home connectivity and scheduling from your mobile devices. What separates this smart plug from other products of its kinds is an extra five amps of compatibility and a nice design that fits two plugs into the panel. 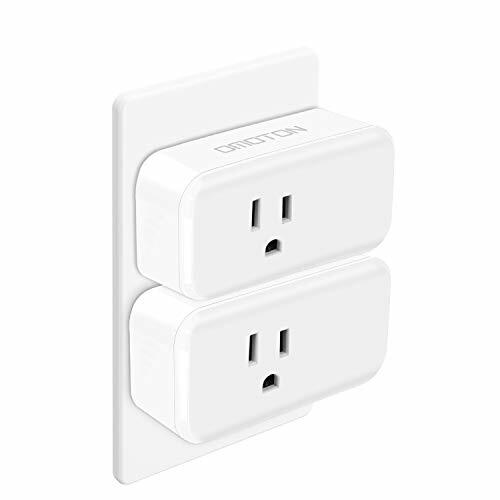 The smart outlets from TONBUX are useful because they fit securely onto the outlet and have a 16 amp compatibility so you can use them to monitor larger appliances. With this unit, you can set scenes and schedules to turn on and off different groups of outlets directly from your phone. This allows you to save money and ensure that you are not leaving lights on. You want to make sure you can do the things you want to do from the app, so you are getting the most out of your smart wall outlet. We want to help you understand the benefits of having a smart device like this in your home, and there are some things you should look out for that will not only save you money but make your life easier. If you cannot figure out how to use the outlet, it won’t be much use to you, so we think it’s incredibly important that you find something that is simple to install and has clear instructions on how to get it set up. 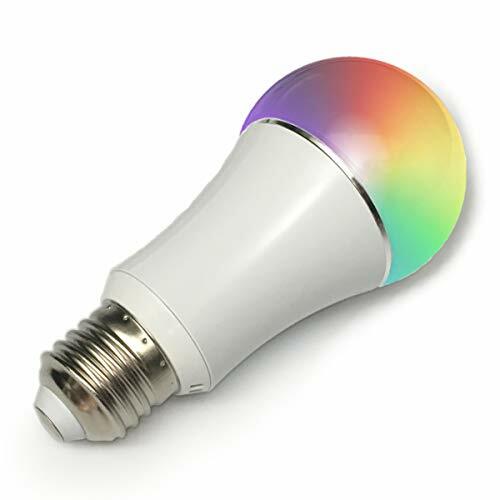 If you do not have other products like this then it could be difficult, so you want a product with clear instructions or even a video online to explain step by step, how to get it running. There are a few products that we reviewed above that have excellent instructions, videos, and technical support that you can call to help get your device set up. Another important factor to consider here is how the app operates once you have everything set up. Read reviews and see what other people are saying about a specific product when it comes to navigating the app. You want to make sure you can do the things you want to do from the app, so you are getting the most out of your smart wall outlet. Another critical thing to consider and a significant issue we find with a lot of these outlets is their ability to connect with the Wi-Fi. You need something that will not be cycling in and out of a given connection because you need to be able to shut something off or turn something on when you want to. All of the products we reviewed have a high-quality connection rating, but some are still better than others, so you want to get the outlet that connects easily and stays connected when you need it most. As with anything dealing with electricity, there is a danger factor associated with it. You need to go for an outlet that is compliant and certified through the FCC to be safe. The safest outlets will be resistant to flames and electrical surges or arcs. Pay attention to the heat of the unit as well when it is running. Some of these units run up to 16 amps, so there is quite a bit of power running through them and on top of that you are shutting the power off and on which draws more power in. Our goal for this article was to show you why having a smart outlet could positively impact your life. Having the ability to turn things on and off when you forget is a powerful thing and as we age our money becomes more and more important to us. Pick up one of the smart outlets above, and you may find that you’ll make your investment back while enjoying an efficient and streamlined living experience.